PHOENIX – A bag of puke, a baby diaper and a live turtle. These are among the items that Cassie Lubenow wades through for four hours each day. Flies swarm around Lubenow’s workstation, a raised plywood slab covered with refuse from this trash-sorting facility. Her mission: sifting through piles of residential trash to help the city of Phoenix learn how to get people to recycle more. The 27th Avenue Transfer Station sorts 60 percent of all residential trash the city throws away. 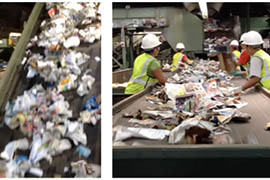 Though the facility has about 30 full-time employees, Lubenow sorts recyclables as part of her master’s degree program at Arizona State University’s School of Sustainability. John Trujillo, Phoenix Public Works director, said that 90 percent of what people throw away can be recycled. The city aims to have 40 percent of trash diverted from landfills by 2020. At present, that figure stands at 16 percent. The city commissioned North Carolina company Cascadia Consulting to oversee the study in collaboration with ASU Sustainability Solutions Initiatives. There will be 260 garbage and 200 recycling samples collected and analyzed, split between summer and winter to get a more dynamic understanding of what Phoenicians put in their trash bins. The city’s last waste study was in 2003. Those results showed that nearly two-thirds of trash from single-family homes could have been recycled. About 550,000 tons of trash is dumped annually from residential areas in Phoenix alone. With a rising population, Trujillo said that a 40 percent diversion by 2020 would barely make a dent but is a good starting point. In an effort to encourage residents to use their recycling bins more and their trash bins less, the city has been promoting smaller trash containers that will save users $3 a month in garbage collection fees. However, adding a waste bin to hold organic waste costs an additional $5 a month. Instead of being driven 40 miles away to a landfill, items like aluminum or lawn clippings can be recycled then sold in tons, Trujillo said. These materials can be converted into other products or can be used for fuel and energy. For example, GRO-WELL buys composted organic waste from the 27th Avenue Transfer Station to create products including potting soil. The city has spent $250,000 on conducting the study but has an additional $400,000 if officials want to add or expand on specific matters, like green waste. Results from the study help determine what community programs the city will implement, said Yvette Roeder, a Phoenix Public Works spokeswoman. She anticipates that preliminary results will be available in about four weeks. Until then, Cassie Lubenow will continue to separate valuable recyclables from food waste and refuse in order to further her major and the Waste Characterization Study. 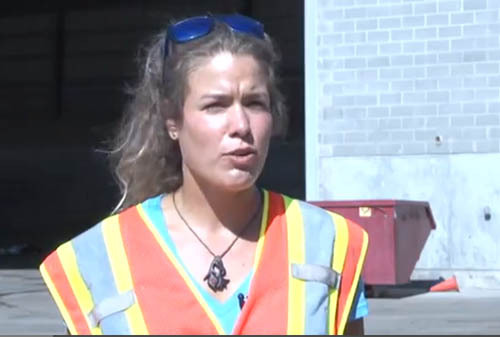 But she said seeing all the cross-contaminated trash is frustrating and hopes the study results will be a catalyst for change. 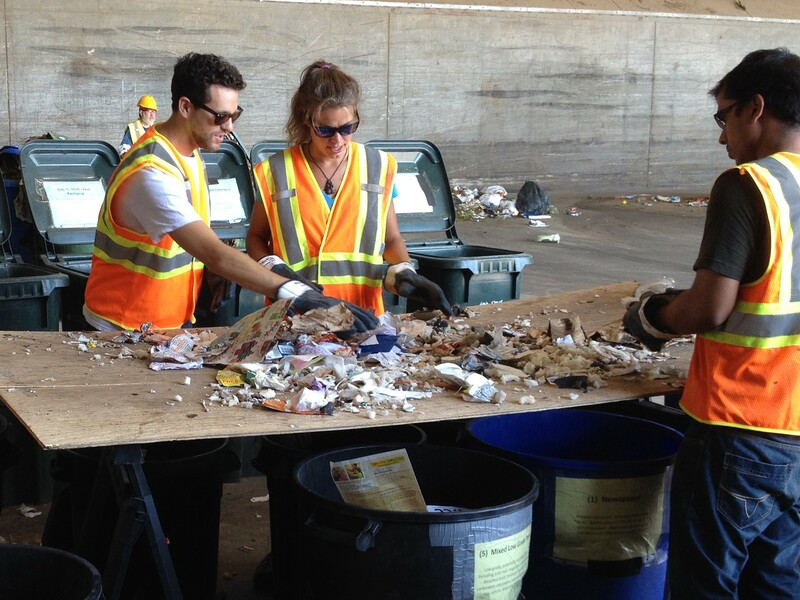 The city of Phoenix is working with Arizona State University to discover ways to send less garbage to landfills. That has students sorting through trash. Experience sights and sounds from the garbage transfer station via PicPlayPost. Arizona State University students Andy Stein and Cassie Lubenow sort through refuse as part of a trash study meant to increase recycling in Phoenix. Landscapers are encouraged to bring green waste to the 27th Avenue Transfer Station in Phoenix rather than dump it in regular trash bins.